I will try to show you here how you can learn to learn by failing, because failing is actually not always bad. You’ll get what I mean in a moment, keep reading. 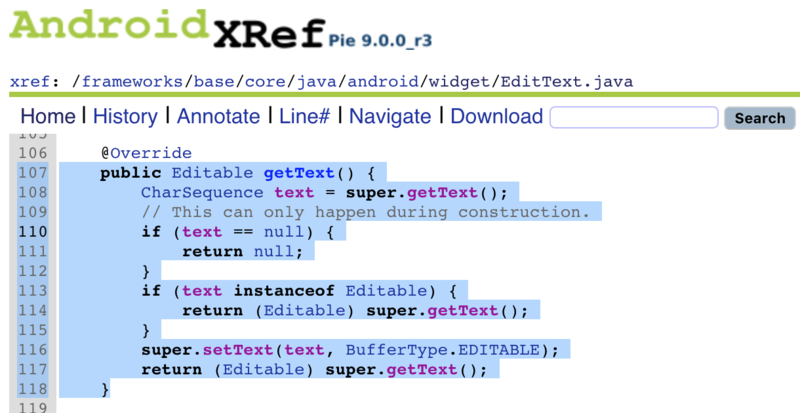 We will not just solve an exercise, we will go deep into the Android docs and Android’s source code itself so we can really understand why things are like they are. So yes, this will take us some time, take a cup of good coffee because we are going to dive deep into the details. What are we going to learn along the way? We can expect that when we click on the login button, it will retrieve our text from the text fields (EditText objects). Return the text that TextView is displaying. you can cast the return value from this method to Spannable or Editable, respectively. 109        // This can only happen during construction. // Our code snippets go here. The -U is for USB device, -l means load. You can run, quit with q and run again, or just overwrite the file and when you save it it will be automatically re-loaded by Frida. [object Object], [object Object] ... ? Definitely not what we want. We cannot build a String just by using whatever retval is. This won’t throw an error but it results again into [Object object] outputs. It did not work as we wanted but look, the error says that the class android.text.SpannableStringBuilder cannot be casted to java.lang.String. Let’s correct the casting. It keeps printing as we type. This works as well as the other code but you won’t be able to take a look at the original code in other cases so it’s good that you learn how to deal with those errors and castings. If you are curious and want to understand why that Spannable-thingy came, just take into account that EditText inherits from TextView (that’s why we see that it calls super.) and look at the TextView.getText code here. Once here, why not changing the output? Just for fun. Error: Implementation for getText expected return value compatible with 'android.text.Editable'. We will take two approaches: static and dynamic analysis. We see that loggingUsername does not have an inputType, so it will be the default (TYPE_CLASS_TEXT | TYPE_TEXT_FLAG_MULTI_LINE -> 131073). loggingPassword has an inputType and it is textPassword. textPassword	81	Text that is a password. Corresponds to InputType.TYPE_CLASS_TEXT | InputType.TYPE_TEXT_VARIATION_PASSWORD. The 81 is in hex, also 0x81. I like to use radare2 for this stuff as well, run this command rax2 0x81 -> 129. See rax2 help for more. Reference and recommendations on how to set values in the layout XML can be found here. Did you noticed the | when setting the inputType? The operator | is a bitwise logical or (also used as ^). You can also use rax2 to calculate that (=10 for base 10): rax2 =10 1^128 -> 129. The bitwise operation is 00000001b ^ 10000000b = 10000001b. What about the android:password attribute for TextField? 4670             password dots instead of themselves. So better stick to inputType and use it correctly. EditText inherits from TextView, which offers a method called getInputType. Let’s add it to our hook. I’ve added an extra line to get the layout ID as well. We were able not only to solve the OMTG_DATAST_002_Logging exercise but to learn how to solve problems that might arise when writing hooks with Frida, to read the docs and the source code if necessary, because this is the only way to really understand something, just by going deeper and getting our hands dirty. I hope you have found this article interesting and learned a couple of things here, all things I’ve promised at the beginning and more.